I attended Alaska Pacific University Outdoor Studies Program and have been part of the Mountain Trip family since 2007. 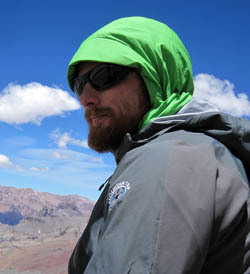 Since then, I have guided 17 Denali expeditions, three expeditions each on Aconcagua and Mount Vinson. I live in Anchorage with my wife Amara and recently have been learning the finer points of how to fly helicopters. Anchorage is a great base for adventures, and I’ve made many ascents in the Alaska, Chugach, and Talkeetna ranges. I also work as an outdoor educator and adjunct professor at University of Alaska Anchorage, where I have taught thousands the fundamentals of climbing safely in all types of terrain. I hold current certifications for Wilderness First Responder (WFR), Avalanche Level 1, and American Mountain Guides Association (AMGA) Rock Instructor. I love sharing wild places with new friends and look forward to my next trip into the mountains!